Open to all artists 18 years old and over. Work must be original, both in concept and execution. Oil, Oil Pastel, Soft Pastel, Water Media, Drawing Media, Alcohol Ink, Printmaking, Mixed Media and Collage. Sculpture, Photography, Computer generated art. Work done under supervision, which includes any in a class or workshop. Copied Work, Work previously accepted into any NVAL juried show. Malcolm is an accomplished oil painter and sculptor from Redding, CA. His paintings have been shown at numerous locations in the Redding area and are held in a number of private collections both locally and elsewhere. may be picked up January 8 – 12. The juror will select art work for the show from the entries submitted. Artists will receive notification by mail of selected and/or not selected entries. Awards are given at the juror’s discretion. The decision of the juror is final. Awards will be presented at the reception on Saturday, January 12, 6 – 8 pm. All reasonable care will be taken with the art work. However, North Valley Art League will not be responsible for loss or damage. Submittal of entry constitutes an agreement on the part of the entrant to the terms and conditions of this prospectus. California sales tax is collected by NVAL on all art work sold. NVAL retains a 20 percent commission on all sales. Paintings must remain in the Gallery for the entire show. The juror will select art work for the show from the entries submitted. Artists will receive notification by mail of selected and/or not selected entries. Awards are given at the juror’s discretion. The decision of the juror is final. Awards will be presented at the reception on Saturday, January 12, 5 – 7 pm. 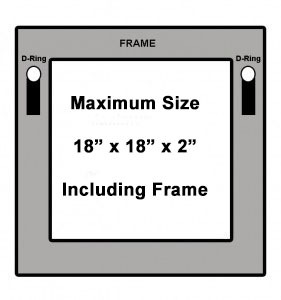 Entries must be framed or be finished 1.5 – 2 inch deep gallery wrapped canvases. Entries must have D-rings or equivalent securely attached to the back of the art work. Attach Label (included with printed version) to the back upper left corner of each submitted piece.